Want to be hired by Audrey? Do you adore small children? Do you like being proactive and helpful? Are you a warm and flexible person? Do you love to play, sing and dance with kids? If so, I may have a great full-time opportunity for you!!!!! My name is Audrey. I am hiring a nanny for my family in Leslieville, Toronto which is located very close to Queen and Broadview. My goal is to chat with skilled, loving and hardworking candidates with live-out availability. My home requires help mainly with looking after my toddler but also some meal preparation, and some house cleaning responsibilities. I am looking for someone who is flexible and adaptable but most important, kind and loving with young children. Someone who loves activities such as going to the drop-in, park, splash-pad etc. but also someone who is more than comfortable with helping with house cleaning duties. I have a 3 months old baby and a young toddler. 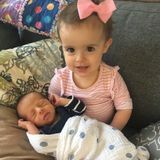 I am presently on maternity leave, so I am looking for a warm and friendly individual who will help me have a great last maternity leave and who will help me take care of my children and home. I am also looking for someone who I can fully trust and who will eventually take care of both of my kids once I return to work. Fluent in English and Spanish is preferable but not a must.